Reading and share top 8 famous quotes and sayings about Temptations In Life by famous authors and people. Browse top 8 famous quotes and sayings about Temptations In Life by most favorite authors. 1. "Mma Ramotswe sighed. 'We are all tempted, Mma. We are all tempted when it comes to cake. 'That is true,' said Mma Potokwane sadly. 'There are many temptations in this life, but cake is probably one of the biggest of them." 2. "A well- informed mind,' he would say, 'is the best security against the contagion of folly and of vice. The vacant mind is ever on the watch for relief, and ready to plunge into error, to escape from the languor of idleness. Store it with ideas, teach it the pleasure of thinking; and the temptations of the world without, will be counteracted by the gratifications derived from the world within. 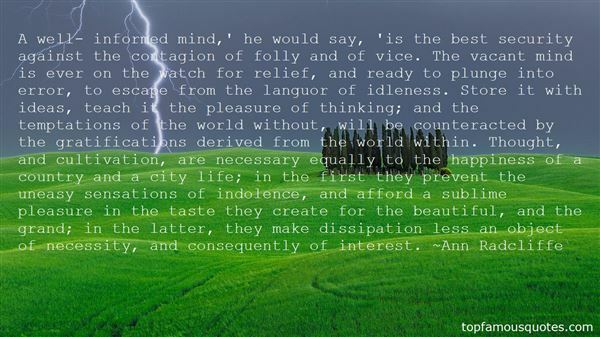 Thought, and cultivation, are necessary equally to the happiness of a country and a city life; in the first they prevent the uneasy sensations of indolence, and afford a sublime pleasure in the taste they create for the beautiful, and the grand; in the latter, they make dissipation less an object of necessity, and consequently of interest." 3. "Yes, as we travel through this topsy-turvy, sinful world, filled with temptations and problems, we are humbled by the expectancy of death, the uncertainty of life, and the power and love of God. Sadness comes to all of us in the loss of loved ones. "But there is gratitude also. Gratitude for the assurance we have that life is eternal. 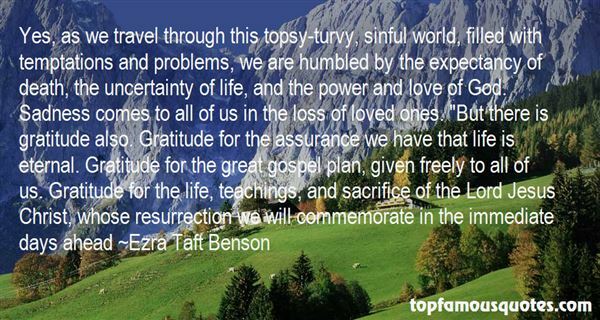 Gratitude for the great gospel plan, given freely to all of us. Gratitude for the life, teachings, and sacrifice of the Lord Jesus Christ, whose resurrection we will commemorate in the immediate days ahead"
4. "When we face…temptations in our time, we must declare, as young Nephi did in his, ‘[I will] give place no more for the enemy of my soul.' [2 Nephi 4:28]We can reject the evil one. If we want it dearly and deeply enough, that enemy can and will be rebuked by the redeeming power of the Lord Jesus Christ. Furthermore, I promise you that the light of His everlasting gospel can and will again shine brightly where you feared life had gone hopelessly, helplessly dark." 5. "Literature is a source of pleasure, he said, it is one of the rare inexhaustible joys in life, but it's not only that. It must not be disassociated from reality. Everything is there. That is why I never use the word fiction. Every subtlety in life is material for a book. He insisted on the fact. Have you noticed, he'd say, that I'm talking about novels? Novels don't contain only exceptional situations, life or death choices, or major ordeals; there are also everyday difficulties, temptations, ordinary disappointments; and, in response, every human attitude, every type of behavior, from the finest to the most wretched. There are books where, as you read, you wonder: What would I have done? It's a question you have to ask yourself. Listen carefully: it is a way to learn to live. There are grown-ups who would say no, that literature is not life, that novels teach you nothing. They are wrong. Literature performs, instructs, it prepares you for life." 6. "The temptations are great to simply retreat to the domain of private life and give up on our public problems." 7. "My child, the troubles and temptations of your life are beginning, and may be many; but you can overcome and outlive them all if you learn to feel the strength and tenderness of your Heavenly Father as you do that of your earthly one. The more you love and trust Him, the nearer you will feel to Him, and the less you will depend on human power and wisdom. His love and care never tire or change, can never be taken from you, but may become the source of lifelong peace, happiness, and strength. Believe this heartily, and go to God with all your little cares, and hopes, and sins, and sorrows, as freely and confidingly as you come to your mother." 8. "What is morality? It is not the following of enjoined rules of conduct. It is not a question of standing above temptations, or of conquering hate, anger, greed, lust and violence. Questioning your actions before and after creates the moral problem. What is responsible for this situation is the faculty of distinguishing between right and wrong and influencing your actions accordingly.Life is action. Unquestioned action is morality. Questioning your actions is destroying the expression of life. A person who lets life act in its own way without the protective movement of thought has no self to defend. What need will he have to lie or cheat or pretend or to commit any other act which his society considers immoral?" What did you do. Hopkins, after you had made certain that you had made certain of nothing?"